The very young Dickinson High School baseball team will count on their senior leaders to be competitive in 2019. From left are head coach Mario Santana, Norberto Estremera, Jason Colon and Brian Torres. 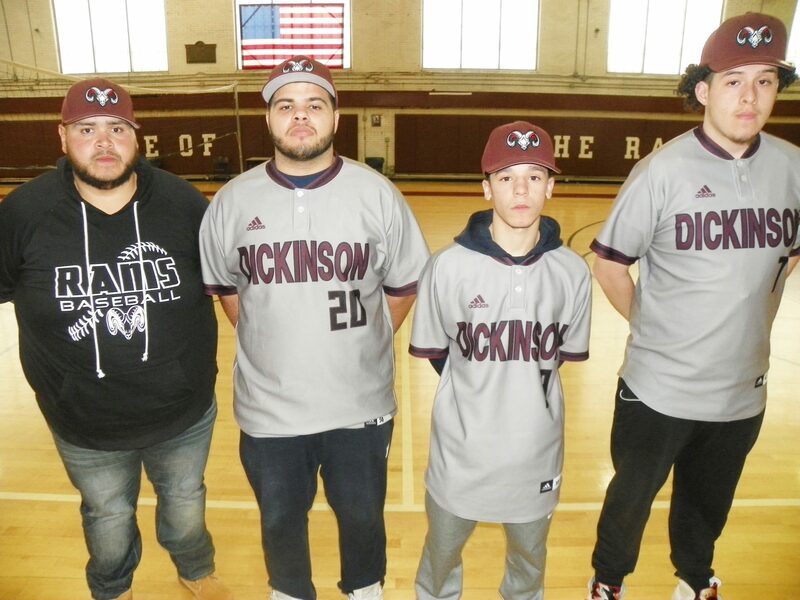 Mario Santana is in his third year as the head baseball coach at Dickinson High School and there’s no question that this is his best Rams team to date. Santana likes the fact that the Rams have been working hard throughout the offseason. Santana notices that teams are not taking the Rams seriously. Leading the returnees is junior Rafael Solano, who earned Hudson Reporter All-Area honors last spring as a utility performer. Solano is also the team’s leadoff hitter who runs well. So Solano will be asked to get on base, steal his share of bases and score runs. Junior Jose Garcia is another right-handed pitcher who will be an excellent complement to Solano. Junior Jose Peralta is another righty to anchor the staff. Junior lefty John Courtney is another effective pitcher who can start or relieve. Freshman Diego Moran is a promising right-handed hurler. Left-hander Misael Moreta is proving to be a diamond in the rough. Needless to say, that’s plenty of depth for a high school baseball team, especially having two talented freshmen to make a mark immediately. Not many teams can lay claim to having two frosh that will make a positive mark right away. The catcher is senior Brian Torres. Torres is also the Rams’ cleanup hitter. He could have a monstrous season at the plate. Junior Thomas Santiago is the team’s first baseman. Santiago made the successful leap from the junior varsity to the varsity last year and has now become a fixture. Freshman Moran will be the second baseman. Solano is the team’s shortstop. Solano can do so many things at the plate. Solano, who hit .372 last year, is definitely a player to watch. Junior Juan Perozo is the starting third baseman, but senior Norberto Estremera, the son of former Ferris baseball standout Pito Estremera and brother of Natalia Estremera of McNair Academic softball fame, is pushing his way into the regular lineup. Norberto Estremera has the genetics to be a great player, considering both his father and sister were Hudson Reporter All-Area honorees (Natalia was a rare four-time All-Area selection). Junior Edgar Garcia is the team’s left fielder. Junior Jose Garcia is the team’s No. 2 hitter and centerfielder. The right fielder is senior Jason Colon, who also could pitch if needed. Colon has a strong arm in the outfield and will get his share of outfield assists during the course of the season. The Rams will certainly be competitive, as long as they survive the early portion of the schedule, facing powerhouses like Memorial and St. Peter’s Prep during the first week.